Top Image: Duane Linklater, Monsters for Beauty, Permanence and Individuality, 2017, 14 cast concrete sculptures. Installation in the Don River Valley Park. Photo: Yuula Benivolski. With their wings folded and faces grimacing, gargoyles have been staring down at Toronto’s streets for nearly a century and a half. We tend to think of them as an “old world” European feature, decorating 500-year-old cathedrals and castles, but turn your eyes up in downtown and you’ll see that Toronto is full of them. When colonizers began industrializing the city in the 1800s, building bigger and building up, gargoyles came with them. By the early 20th century, if you wanted to go to City Hall for municipal business, you were greeted by a gargoyle. If you went to the bank on Front Street looking for a loan, you were greeted by a gargoyle. If you wanted to pray in the Baptist Church on Jarvis Street, you were greeted by a gargoyle. There were likely many more that are no longer still standing, but dozens can still be found around Toronto. For a country and a city that too often imagine colonialism to be a matter of the past, our gargoyles are a clear reminder that its legacy is still with us and it’s a process that’s still happening. Duane Linklater, Monsters for Beauty, Permanence and Individuality, 2017, 14 cast concrete sculptures. 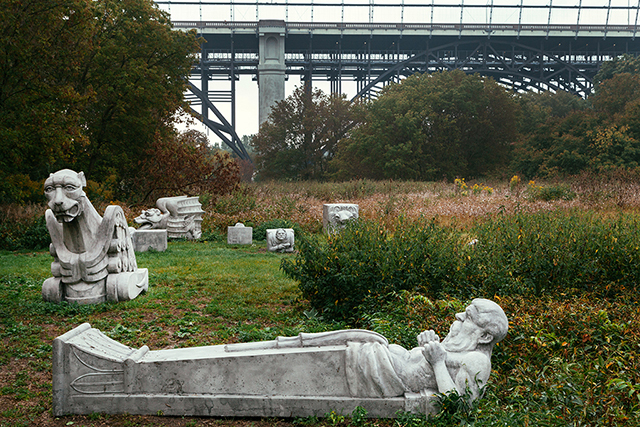 Installation in the Don River Valley Park. Photo: Yuula Benivolski. That fact is the driving idea behind artist Duane Linklater’s new sculpture series, Monsters for Beauty, Permanence, and Individuality, now on display in the Don River Valley Park along the Lower Don Valley Trail. 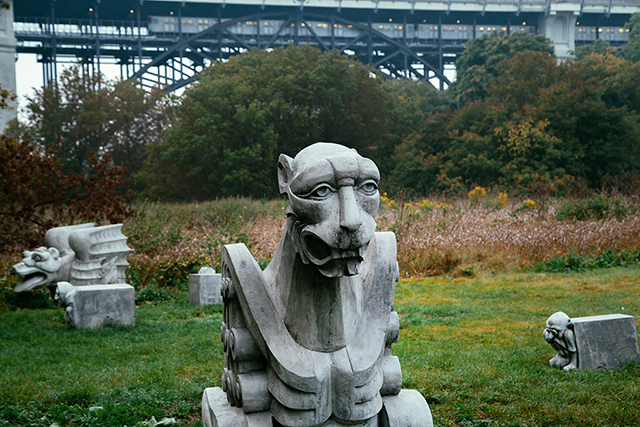 Linklater, who is Omaskeko Cree from Moose Cree First Nation, has made concrete casts of some of Toronto’s most distinct gargoyles and placed them in the Don Valley. He says that gargoyles emerged around the city as resource extraction accelerated, especially along the Don. To meet the needs of the growing city, the valley’s hills were carved away for their clay and minerals and the Don River was straightened, twice. So, it’s somewhat fitting that these creatures have found their way back to where they began. To find them, you can leave from Evergreen Brick Works, heading up to Pottery Road and then snaking south along the trail. Or, you can hop on the trail at Riverdale Park and follow the river upstream. When you find the gargoyles there in the valley, amidst the grass and tall trees, there’s an eerie sense you’ve stumbled upon ruins. They stand in a scrubby clearing, like the last remaining relics of an ancient palace garden. There are 14 altogether, ranging from squat blocks adorned with roaring lion heads, to an enormous, eight foot long and exquisitely detailed man. What’s especially striking is just how close you can get to them. On buildings, these gargoyles were always far away. They were out of reach and so their details were hazy. Up close you can see the smirk of an upturned mouth and the texture of scales and claws. It also means that it’s art you can engage with hands-on. There are no ropes or glass around the gargoyles, so viewers are welcome to touch and pose with them. Kids can climb and play on them too. By placing these gargoyles in the valley, Linklater is provoking a conversation about Canadian colonialism and the relationship between settlers, the land and Indigenous Peoples. By repositioning these statues from our past and present into the valley, it’s a chance to re-evaluate our plans for its future. This time, instead of thinking about everything we can take from the valley, we’d do well to think of the things that need to stay the same. You can see Monsters for Permanence, Beauty, and Individuality on the Lower Don Trail.